And it’s not even very difficult. It takes half the day, but the majority of the process involves waiting rather than doing. And waiting isn’t that hard, especially if there’s a bottle of champagne nearby. 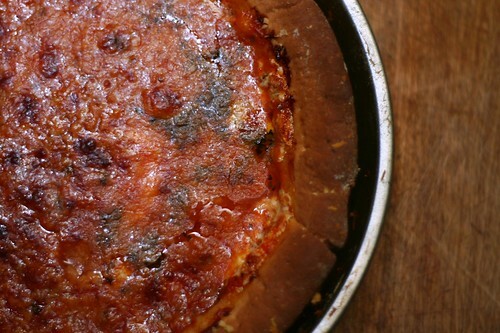 The distinguishing feature of Chicago’s deep dish pizza is the crust. And the key to that, as it turns out, is threefold. For starters, you need cornmeal — it’s what gives the crust its hefty crunch. But all the cornmeal in the world won’t prevent a crust from becoming soggy once it’s smothered in tomato sauce, which is why you fill the crust with cheese first, then sauce. Lastly, you slide the whole affair onto a blazing hot pizza stone (or some other such heat-retaining contrivance — perhaps a cast iron skillet or a few bricks) to ensure even heat distribution and a crust that crisps from the bottom up. Seriously, you can do this. And if you live in the sort of place that offers only limp, spongy mockeries of pizza swimming in congealed processed cheese food, you really should. Before you get started I should warn you that this pizza takes about three and a half hours from start to finish, so it’s not really a candidate for a quick weeknight meal. The good news is that the 3½-hour pizza only involves about 20 minutes of actual work. 1) Dissolve yeast in water and set aside. Place dry ingredients in bowl of food processor or electric mixer, fit with dough hook, and pulse to combine. (If you’re using instant yeast you can add it along with the dry ingredients rather than dissolving it in water.) Add yeast mixture and oil and mix on low speed for about 4 minutes, or until the dough forms a ball. Let the dough rest for 15 minutes, then mix again for 2-3 minutes. 2) Form the dough into a ball and place it in a large oiled bowl. Roll the dough in the oil to coat the entire surface, then cover the bowl with plastic wrap. Let the dough sit at room temperature for about 2 hours, or until it has doubled in size. 3) Meanwhile, make the sauce. In a bowl, stir together all the ingredients and set aside. (Yes, that’s it. Reinhart points out that canned tomatoes are already cooked, and the flavors will further develop while the pizza bakes.) You could also use 2 cups of your own sauce, if you prefer. I sometimes do. 4) Place a baking stone (you could use a couple cast iron pans or 4-6 bricks instead) on the center rack of the oven and preheat to 400°F. 5) When the dough has doubled in size, divide it in half and form each half into balls. Place them on the (clean!) countertop (or a floured cutting board), cover with plastic wrap, and rest at room temperature for 15-20 minutes. 6) Oil two cake pans. 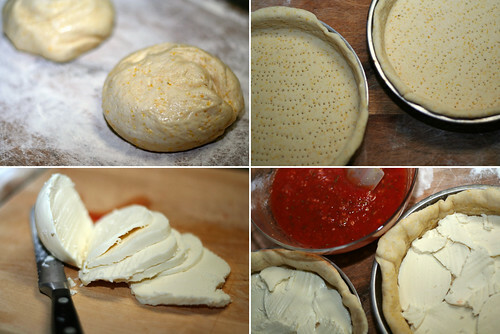 Roll out each dough ball with a rolling pin until each is about 1-2 inches larger than your pans. If the dough resists rolling, let it rest about 5 minutes more. Lower finished dough gently into pan, pressing it into the bottom and up the sides. Crimp any overhang to form a thick edge around the top of the rim. Prick the entire surface (including sides) with a fork. 7) Place pans on preheated baking stone and bake for 3-4 minutes until set. Remove pans from oven and cool for 5 minutes. The rim of the dough may slide down into the pan a bit, but that’s okay. If the crust has bubbled up in the oven, press it back down with a fork. 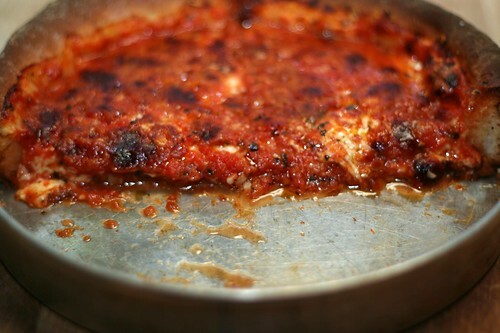 8) Spread mozzarella evenly over bottom of each crust, then ladle in tomato sauce to fill each pan. Sprinkle parmesan evenly over the top of the sauce. 9) Return pans to baking stone in oven, reduce heat to 375°F, and bake for 15 minutes. Rotate the pans 180 degrees and bake 20-25 minutes longer, until crust is deep brown and cheese is golden. 10) Remove pizzas from the oven and cool for 5 minutes before slicing and serving. Wish, for a fleeting moment or two, that you lived in Chicago. This entry was posted on January 25, 2009 by Megan @ When Harry Met Salad. It was filed under pasta & pizza and was tagged with cheese, chicago deep dish, tomato sauce, vegetarian. Boy, that looks good! So you know, I made your chocolate pecan bourbon torte again Saturday night, and it went over really well. I read an article a while ago that said that anything which tasted good paired with lager style beer would taste good with champagne. We tried it out with hot dogs, and it proved to be an inspired pairing, so I would think, based on this article, that Chicago style pizza and champagne would be outstanding together. This looks incredible especially since I am still craving the pizza I just ate in Chicago this past December. No place where I live comes close to it..
Wow.. all your encouragement makes me think I can actually make one of these beauties! Absolutely gorgeous photos. I am soo craving one right now, darnit! 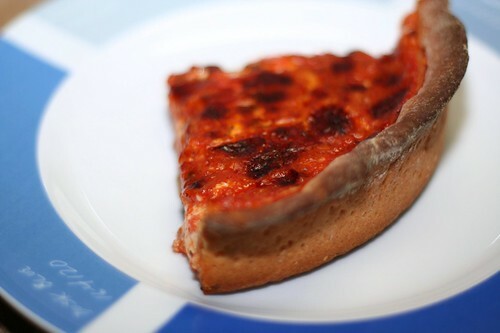 I think I’m the only person alive that doesn’t like deep dish… but I’m not much of a bread lover to begin with. I much prefer thin and crispy pizza – btw, the white pizza went over really well. It was the first thing I made with my new stand mixer. Looks wonderful. We make pizza quite a bit around here. I don’t always let the dough rise – just let it rest after kneading. Surprisingly, it works pretty well so we can do it any evening. I love the idea of enjoying some Champagne while waiting, though!! I’ve recently come to the conclusion that I don’t really like deep dish pizza. I think the New York variety of pizzas are much better than Chicago. 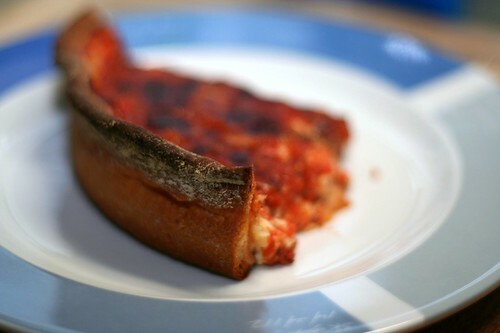 I know this means I will soon be banned from living in Illinois, but I think deep dish is good, but highly overrated. But cornmeal crusts are amazing.